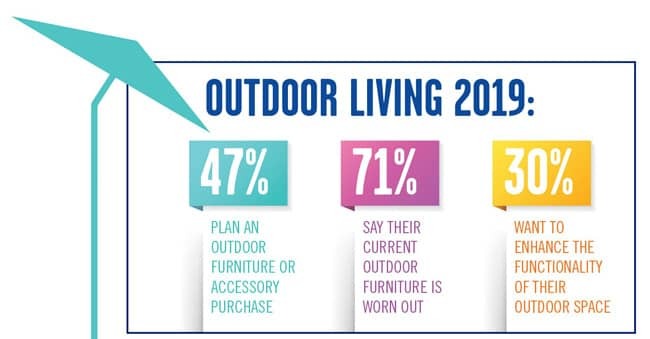 The International Casual Furnishings Association announced that according to new research, 47% of Americans plan to purchase at least one piece of new outdoor furniture or accessories for their homes in 2019, with nearly one-third expecting to add multiple pieces of furniture to their porches, decks and patios this year. The research also revealed that 83% of households have an outdoor living space, with the majority (50%) seating four to eight people. The good news for homeowners today is that eclectic, collected spaces are in fashion for outdoor spaces, and adding furnishings that create a curated look is easier than ever. A range of pieces can be found in a variety of materials, such as all-weather woven vinyl, aluminum, iron, rope, painted glass or wood (or wood look), that can fit into any décor. MIDCENTURY MODERN AND OTHER RETRO LOOKS: Designers are finding inspiration in the 1950s, ‘60s and ‘70s, with midcentury modern style especially popular this year. Classic lines and design elements such as hairpin legs are showing up on outdoor pieces for a fresh, yet timeless look. FIRE: Fire elements remain strong and have become a standard in outdoor living. They are offered in all shapes, sizes, heights and finishes. Consumers love outdoor pieces with fire for the inviting ambience they provide. TEXTURED FABRICS: It’s amazing what manufacturers are doing with outdoor fabrics today, including knitted acrylics that create blanket and sweater looks, or the illusion of texture. Outdoor fabrics have come so far that many consumers are opting to use outdoor pieces indoors because of their beauty and durability. The research was conducted by Wakefield Research on behalf of the American Home Furnishings Alliance and International Casual Furnishings Association among 1,000 nationally representative U.S. adults ages 18 and older between January 3 and January 9, 2019. About the ICFA: The International Casual Furnishings Association, based in High Point, N.C., represents more than 100 manufacturers and distributors of outdoor furniture and accents, along with retailers, sales representatives and suppliers to the industry. For a downloadable version of this press release, as well as the high-res images shown here, please visit the Media page of www.ahfa.us.